I love wearing jeans and jean shorts, but sometimes, change is a good thing!! These pants are my new favorite. 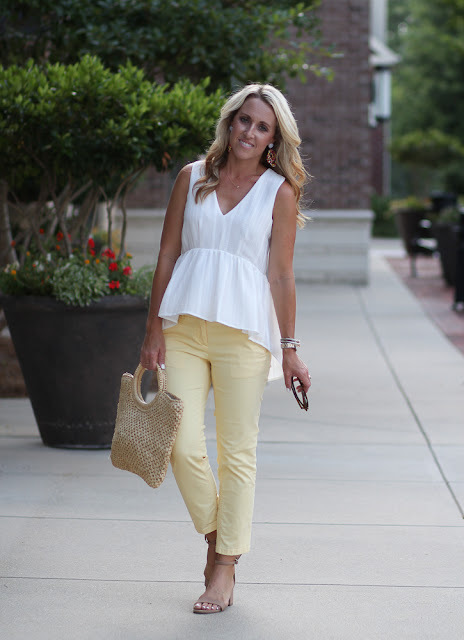 I saw these yellow pants online and first fell in love with the color! Then the cropped skinny fit! I have been really into the color yellow this Summer, so I knew that was the color I wanted. 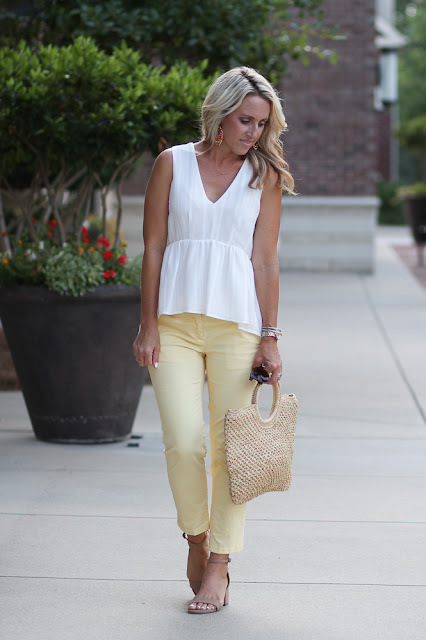 But, if you aren't into yellow, or any bright color, they do come in some great neutral colors. Like olive and grey. 11 colors overall. All on sale, 40%-50% off depending on the color. I am wearing a petite because I wanted to make sure they were a cropped fit for me (only 5'3") but the regular length would be cute too rolled up. 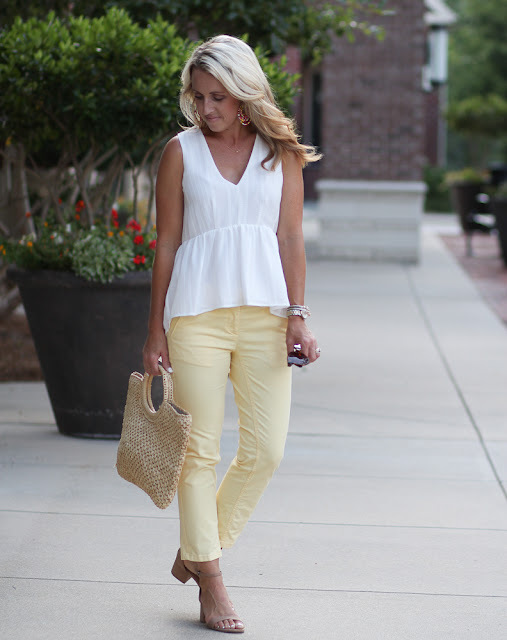 I think these pants will transition into Fall easily with a cardigan and booties! I also need to talk about the rest of my look...so many great pieces. I originally posted this high low hem top back in the early Spring here. It sold out but is now back in stock. It's such a flattering top! Also, these sunglasses that I'm wearing are my new favorite and are an amazing dupe for this designer pair!! And the shoes I've been wearing the heck out of lately, are these block heels. 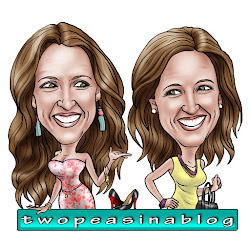 Another dupe for a pricier pair here. They are the look of the ankle strap sandal but with a shorter heel making them ideal for wearing during the day. I don't know about you, but I can't wear high heels all day anymore. Killer!! I've been dealing with a little cold this week. Most of it's in my throat causing a nasty cough and my voice to be super deep. So annoying! Hopefully by the end of the weekend I'm back to 100%. So I think we'll be laying low this weekend. Hopefully you have funner plans! 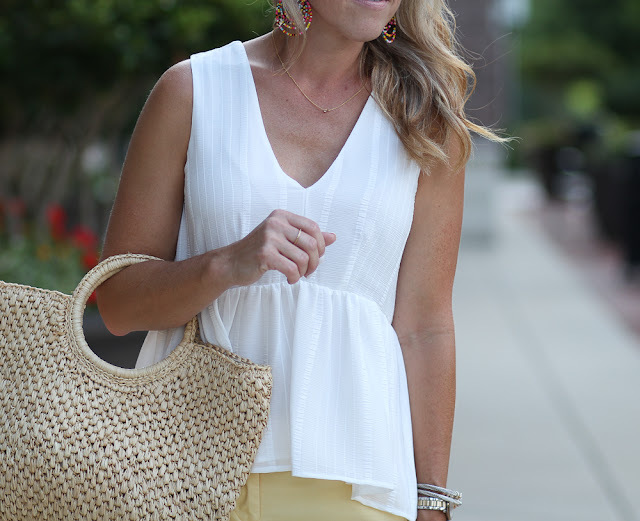 This is the perfect sunny, summertime look!